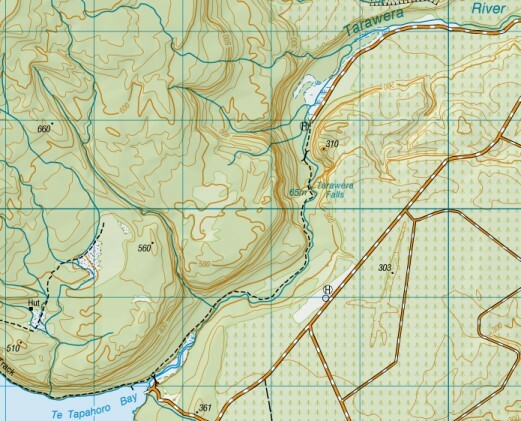 This is, roughly, Bay of Plenty / Urewera / Poverty Bay region. 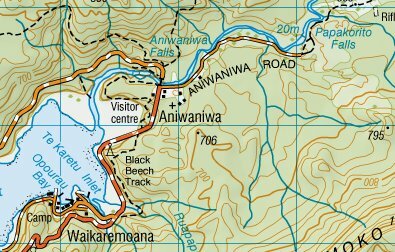 It corresponds quite neatly to the south-east half of the old Auckland province, but nobody seems to take any notice of those old regions any more. 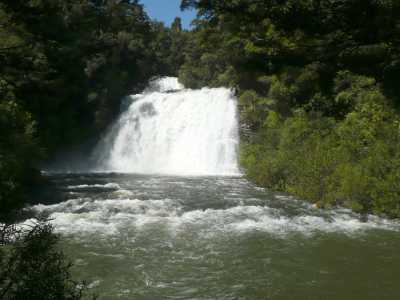 If one starts in Auckland and heads to Gisborne by way of Waikaremoana (not, admittedly, the quickest way to do it) one can pass most of these falls, and Wairere as well. It would take at least two or three days to do it properly though. 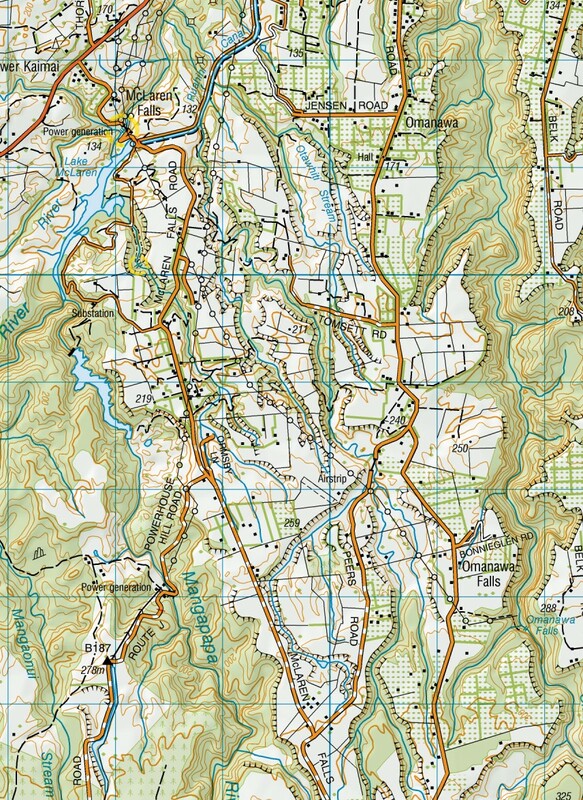 All maps on this page are sourced from LINZ. Crown Copyright Reserved. (Though I've added markings to some of them. Obviously LINZ have no responsibility for that). 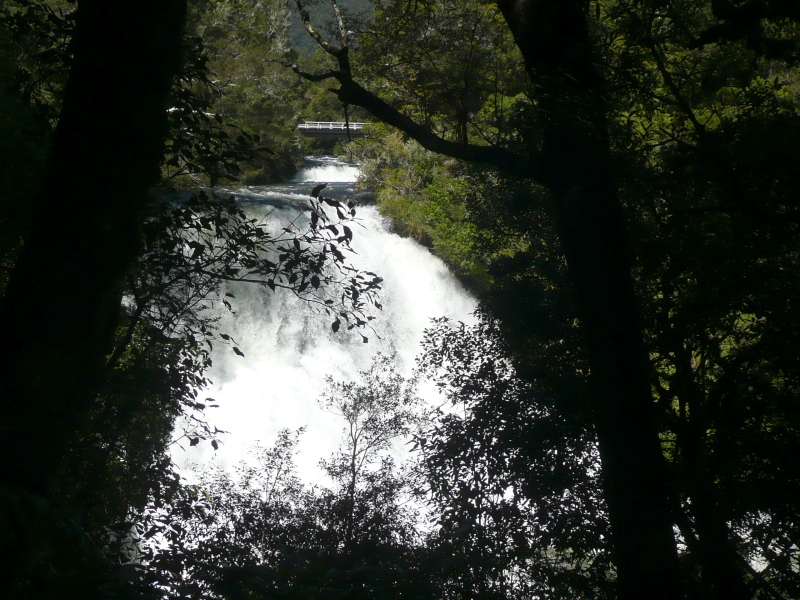 Beyond the falls, a narrow road winds through the extensive park alongside the lake. 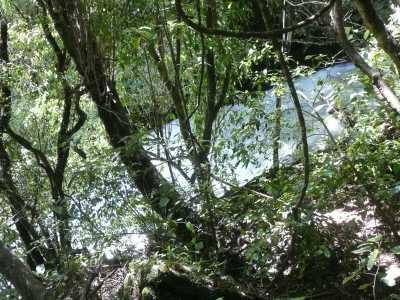 After half a mile a parking area with a 'Waterfall' sign gives access to a foot track alongside a small stream through the bush. 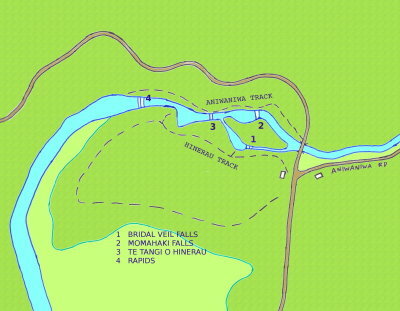 The track runs up one side of the stream for a few hundred yards to the fall, and back down the other side. The fall itself is small but nicely shaped. 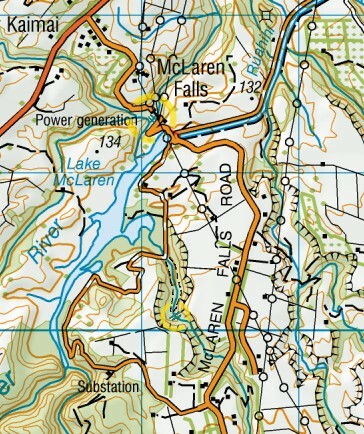 Beyond this the road meanders and branches in a confusing fashion, I eventually ignored a large 'No Exit' sign painted on one road and found the way out to McLaren Falls Road. A few miles to the south-east is Omanawa Falls, another waterfall that has suffered the depredations of hydro power. In a truly spectacular setting, the fall is most striking when flowing full (as Googling shows). 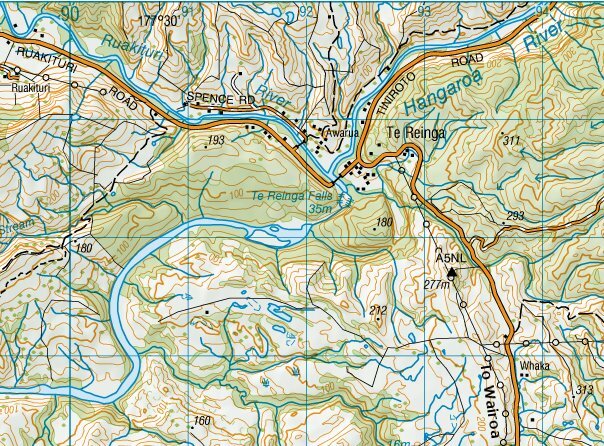 However, in 1915 a power station was built in the gorge, lasting until 1998. Unfortunately, from the scenic point of view, in 2007 a 'hydro electricity enthusiast' leased the power station and resumed operations. The track down from the road suddenly arrives at the edge of the gorge and leads into a gallery high up along the side of the gorge. Far below can be seen the waterfall, in quite spectacular surroundings - the fall emerges from a deep cut in the gorge wall, above a huge cave in the cliff face, and falls into a deep blue plunge pool. The gallery ends at a gate, from which a tunnel descends to the power house. 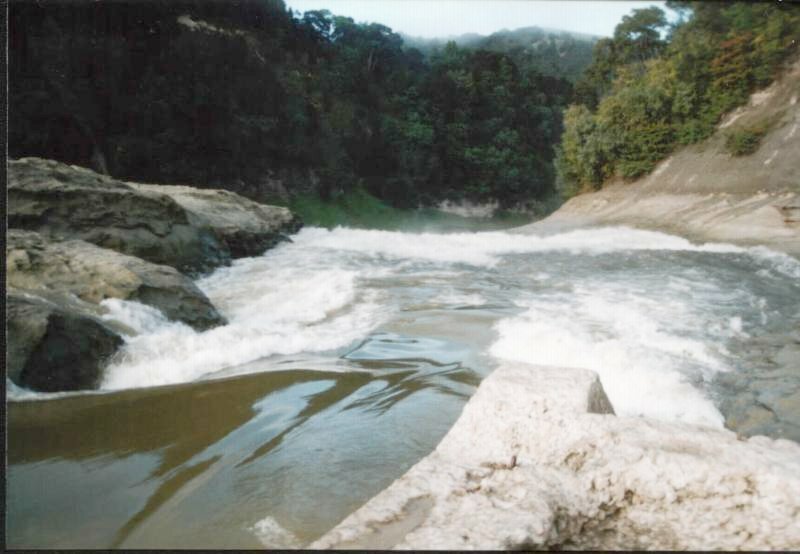 Below, on the edge of the pool, can just be seen a platform and a disturbance in the water that suggests most of the flow is entering there. 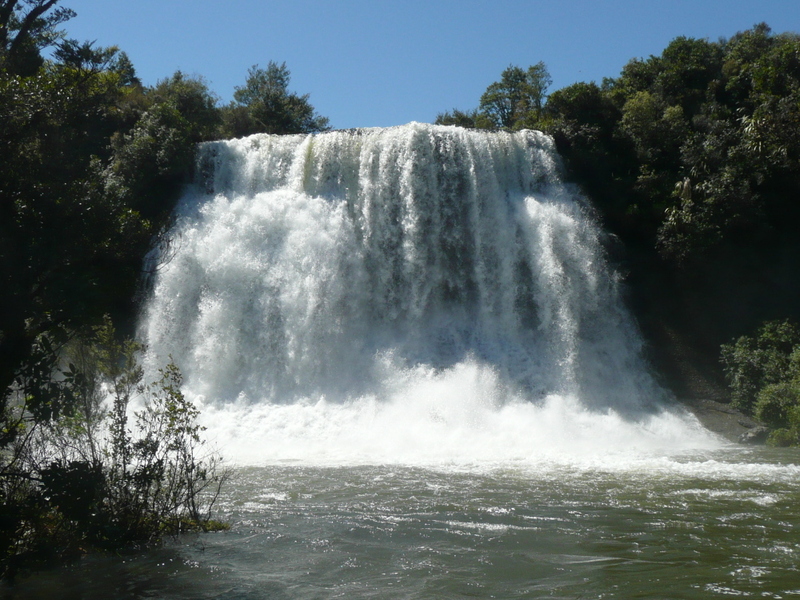 I was very fortunate with Tarawera Falls. On the way from Auckland, Wairere Falls (as I could see from the road) had very little water flowing, surprisingly for late winter; McLaren Falls was as expected turned off, the water being stolen for power generation; and Omanawa Falls had a very small flow, probably for the same reason. 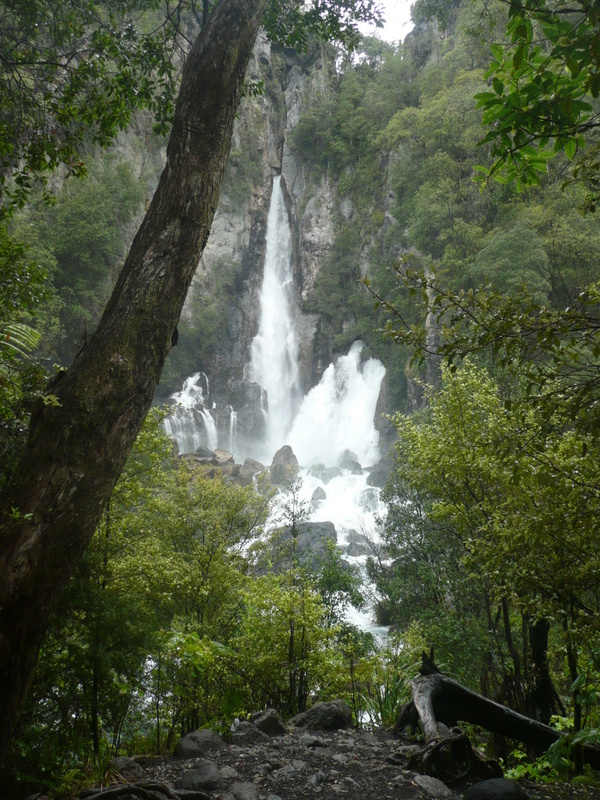 And then it rained miserably all the way to Kawerau, where I bought my forest access permit. 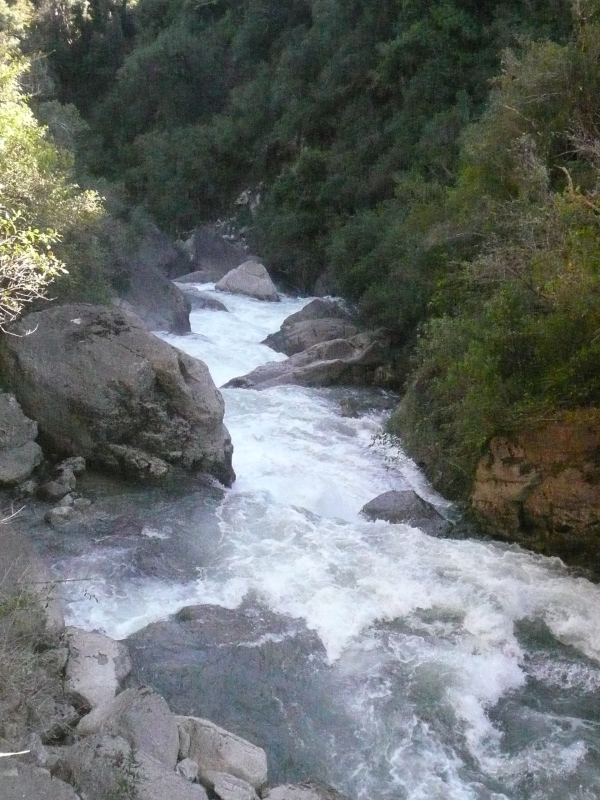 As I crossed the bridge into the forest, the river seemed to be flowing full, which gave me hope. And as I drove the 10 miles through the forest, the rain stopped. 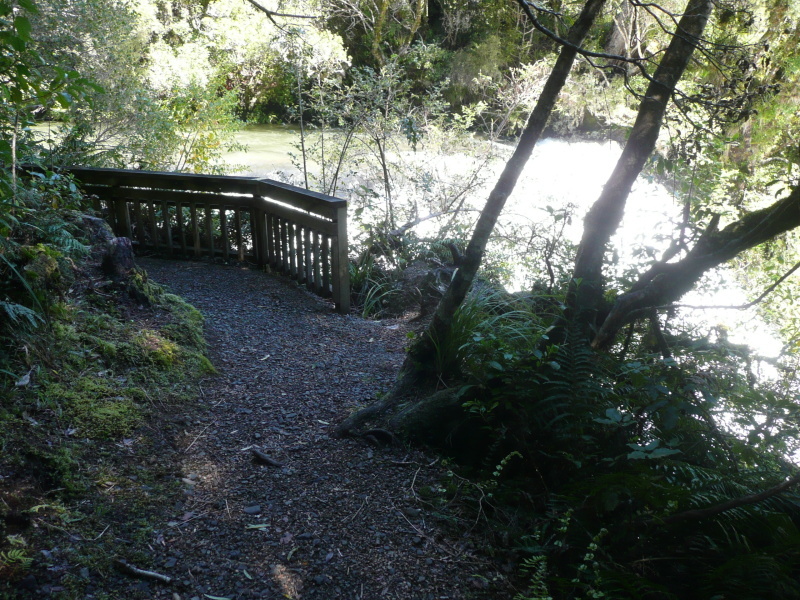 Tarawera Forest access permits are currently (2018) available from the Information Centre, open 9am - 8pm in winter, 'extended hours' in summer, cost $5 - see here , or $6 online here. Forest gates are open from 7-30 till 7-30 (January 2018). A very pleasant foot track runs through the bush alongside the river, which is deep, swift-flowing and clear water with a sandy bed, it looks magnificent. 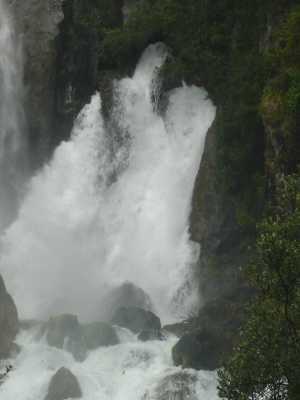 The falls themselves burst out of caves in the cliff face, which is the end of a lava flow, with a drop of 35m . There's a high companion fall with a drop of 65m - 213 feet , which only flows on occasion, and (judging by the percentage of photos in Google) not all that often. On this occasion, it was flowing strongly. 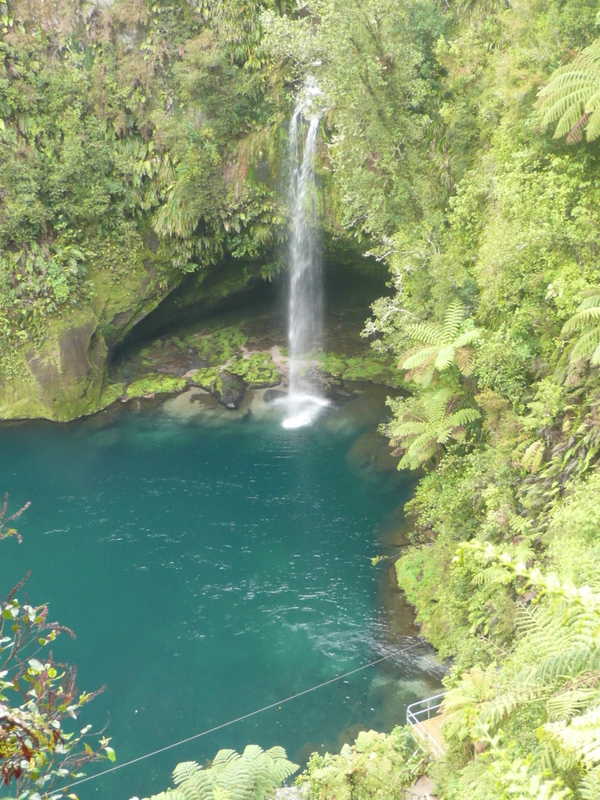 Two waterfalls for the price of one. It was a beautiful and most impressive sight. 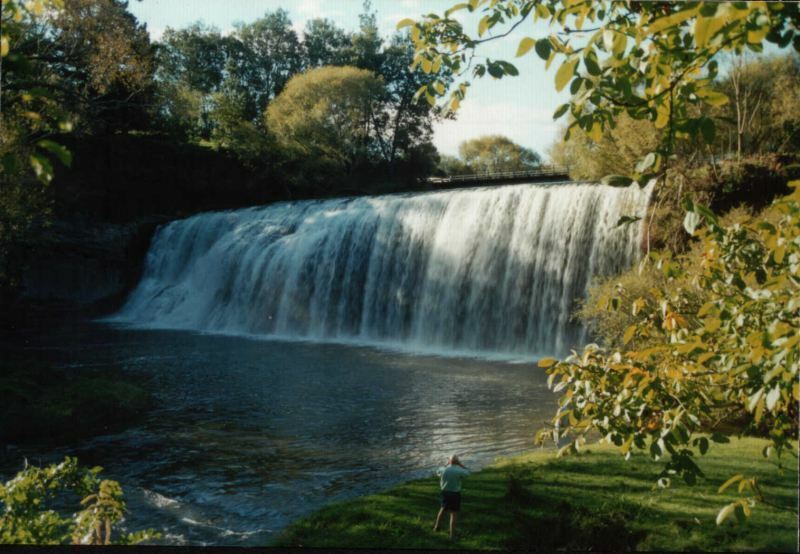 On the strength of the delightful walk alongside the river, and the impressive surroundings, I would rate this the most pleasant and satisfying waterfall to visit in North Island. 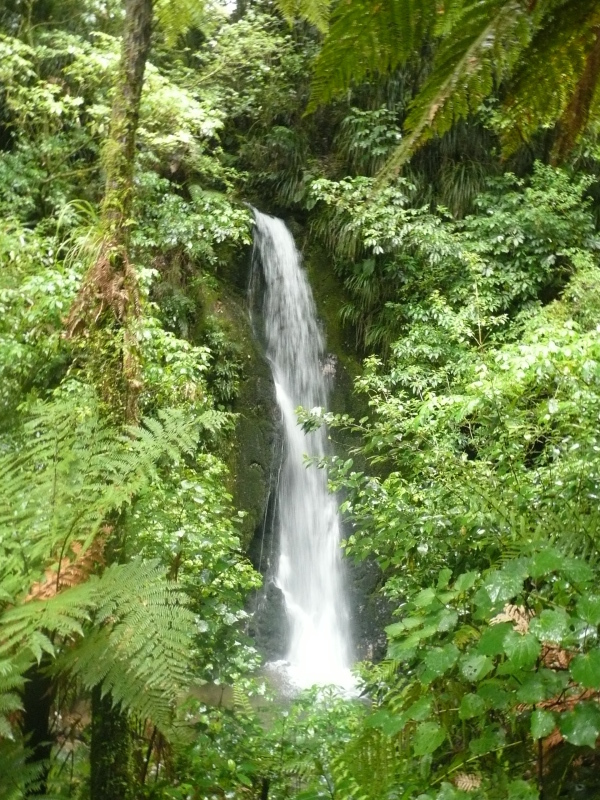 Beyond Kawerau lie the Urewera Ranges, bush-covered, green and rainy. 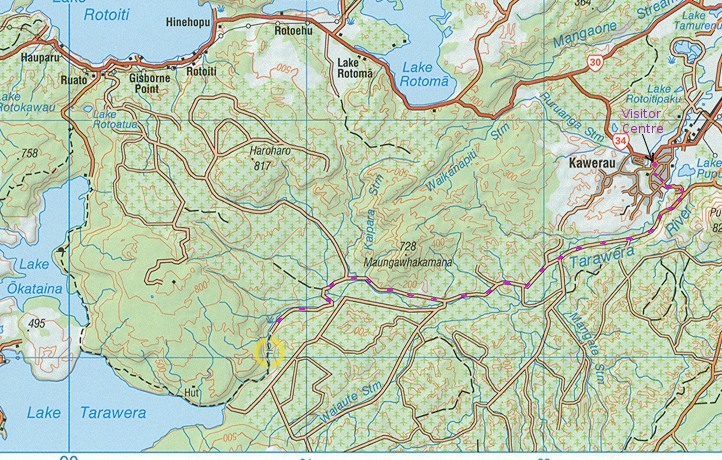 The road from Kawerau to Murapara lies through flattish pine forests. (Last petrol at Murupara). 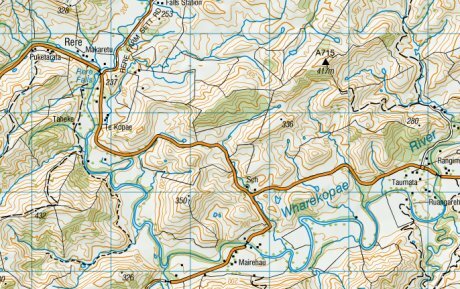 Beyond Murupara, the hills start like a ruled line drawn on the map, and the road starts winding. A few miles later you reach the gravel; 65 of the ??? 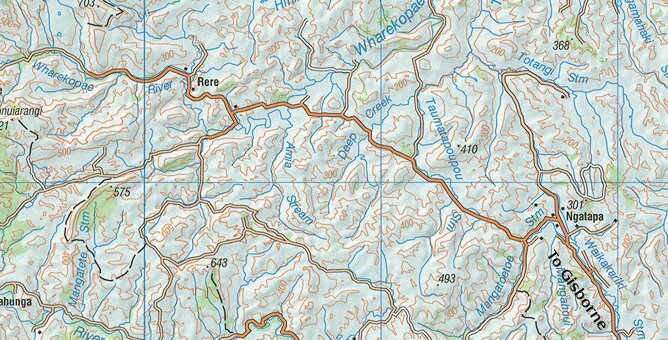 miles between Murupara and Wairoa are gravel. 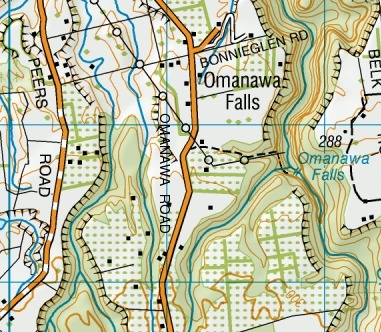 A few miles before the small town of Ruatahuna, the map shows a 40m fall on a small stream on the south side of the road. 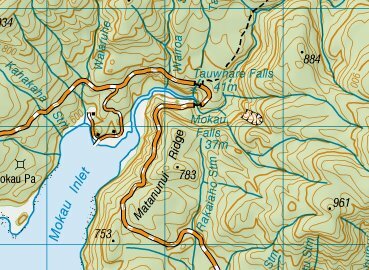 In fact this fall is signposted, it's within a few yards of the road, unfortunately only the lower 10m tier is visible in a deep narrow crack in the hillside, so it isn't very impressive. 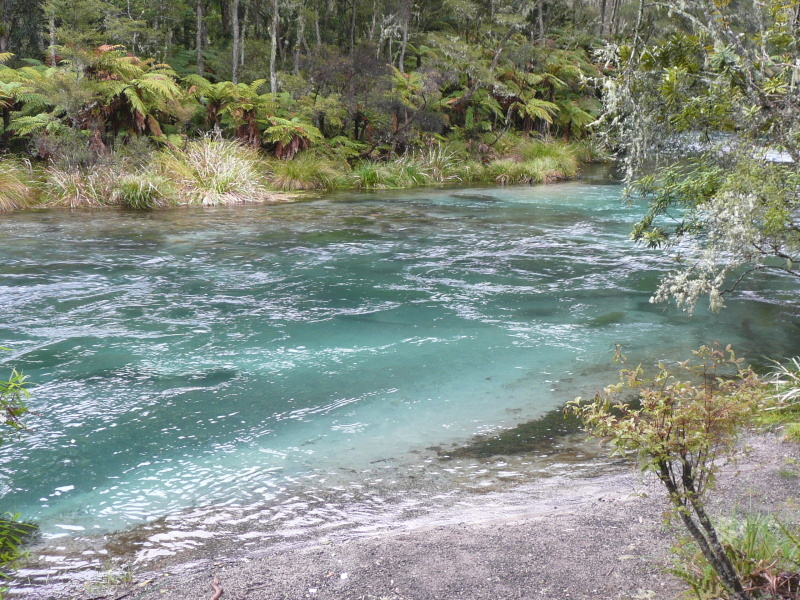 After many more miles of gravel road, the road descends down to Lake Waikaremoana, alongside the Hopuruahine Stream which forms a sizeable rapids at this point. Unfortunately the edge of the road is overgrown with bushes which obstruct any overall viewpoint for the camera. and looking back up the rapids. The cliff face on right seems to be stable but I didn't leave my car parked there for long. 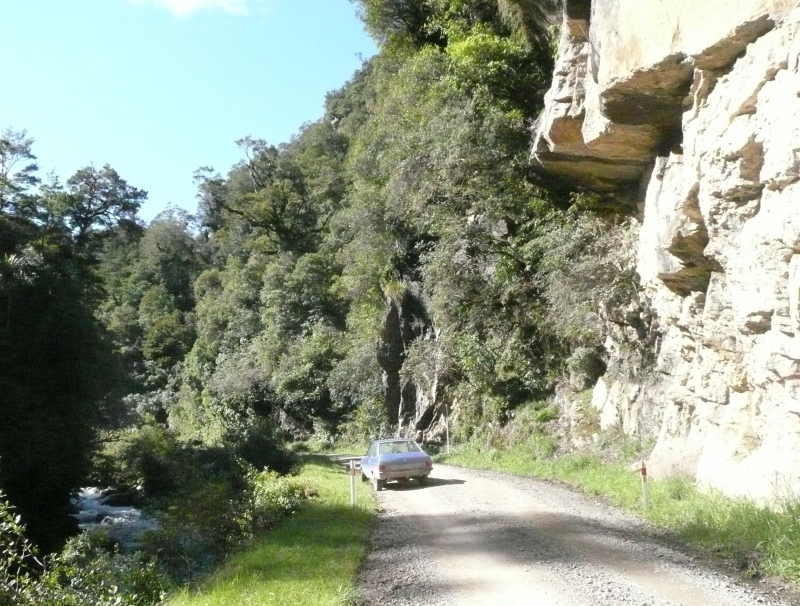 A few miles along the northern edge of the lake, the road loops into the narrow valley of the Mokau Stream. 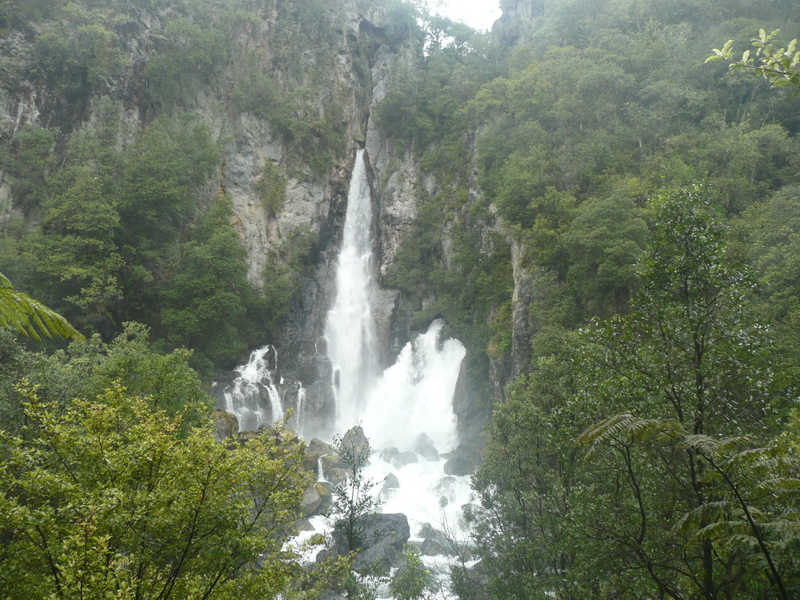 Two waterfalls face each other across the head of the valley. 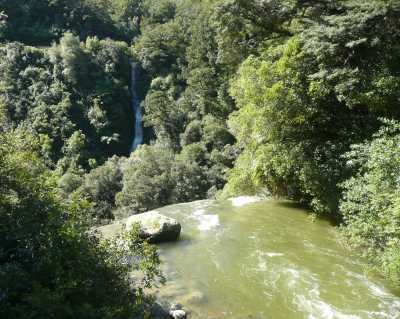 The first one seen is Mokau Falls, 37m. Seen across the valley, the river flows under the road bridge (timber, one-lane) and cascades down a steep rock face. This falls needs a lot of water to adequately cover the full width of the face, as on this fortunate occasion. Right beside the viewpoint for Mokau Falls, the road crosses over the very edge of the 41m Tauwhare Falls. 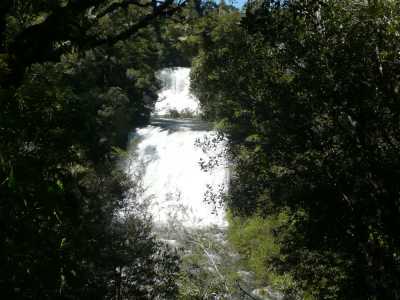 You can stand beside the road and look straight down the drop of the falls. 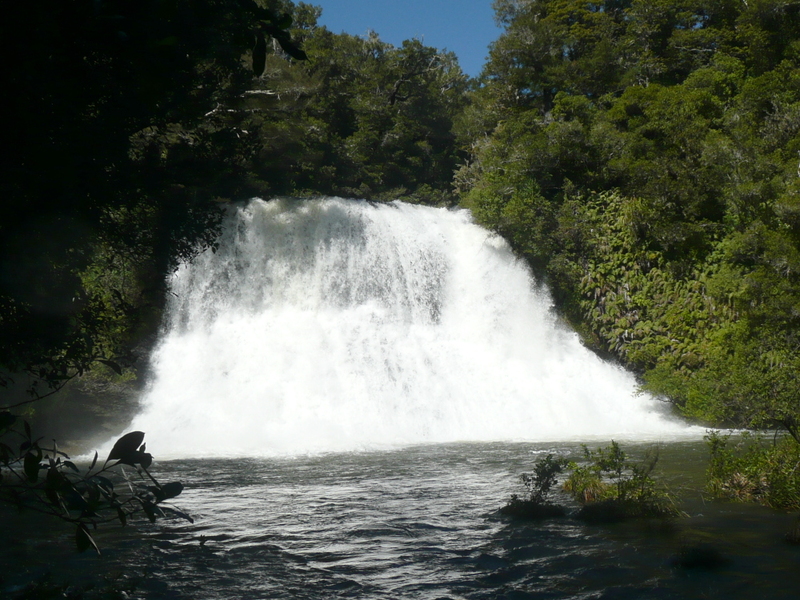 However, the best place to see this waterfall is, by a satisfying symmetry, right above the crest of Mokau Falls. There's a cluster of waterfalls on the Aniwaniwa Stream (hey! 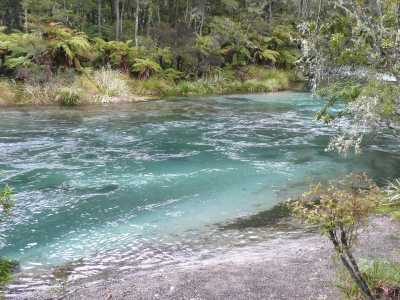 some of these streams are full-grown rivers, I think) which flows into the lake by the Waikaremoana visitor centre. Curiously enough, in this region, the valley of the Aniwaniwa Stream is broad and flat. A mile upstream from the main road bridge is Papakorito Falls. You can see it from the car park at the end of Aniwaniwa Road. A wide well-proportioned fall, 20m high, with a sloping base that makes the water fan out at the bottom (the Aniwaniwa falls downstream have this trick, too). (The photo captions were of course all added later, when I'd worked out which fall was which). If you can't stand the suspense, scroll to the bottom of this section where the map explains all. "The answer, when found, will be obvious" - but it certainly wasn't obvious to me at the time. 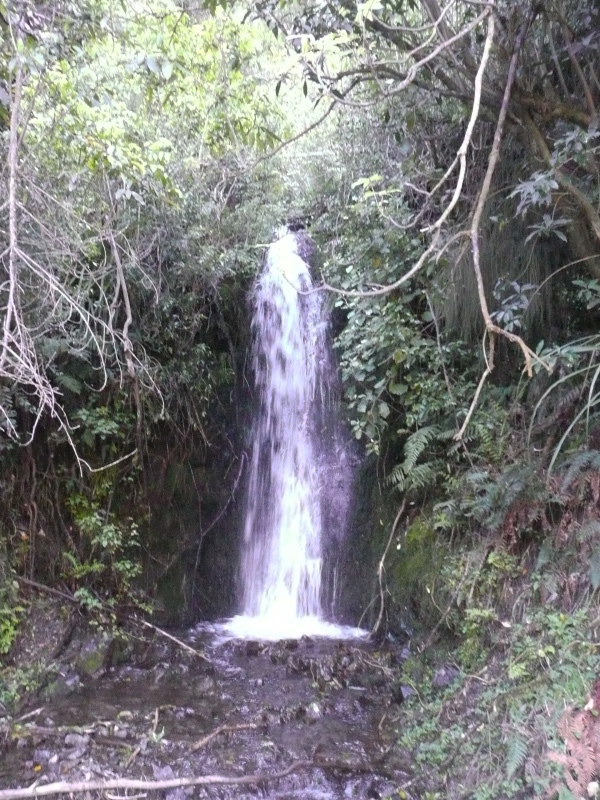 ... and a side track led to the water's edge facing Bridal Veil Falls. The water was so bright in the sun that the camera thought the open shade under the trees was darkness. This photo, like most of these, has had some digital fiddling done, but it can only do so much. ... and 50 yards further on a side track leads a few yards down a ridge to a seat looking through a gap in the trees to the lower falls, with the upper falls perfectly framed behind them. Odd, though, they seemed further away than I would have expected from the short distance I'd walked. 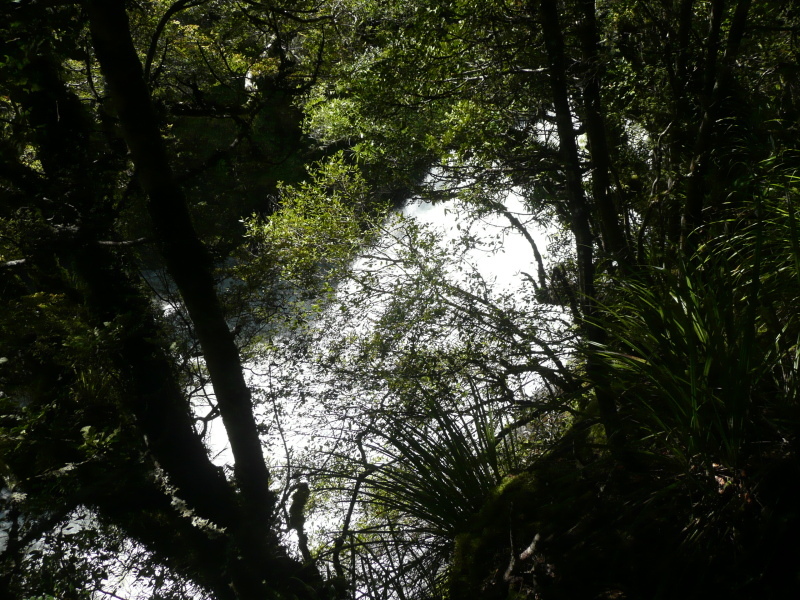 From the seat, a steep but easily descended track (more like a ladder of tree roots) leads down to the shore for a closer look at the lower fall. Then back up the track to cross the road bridge. 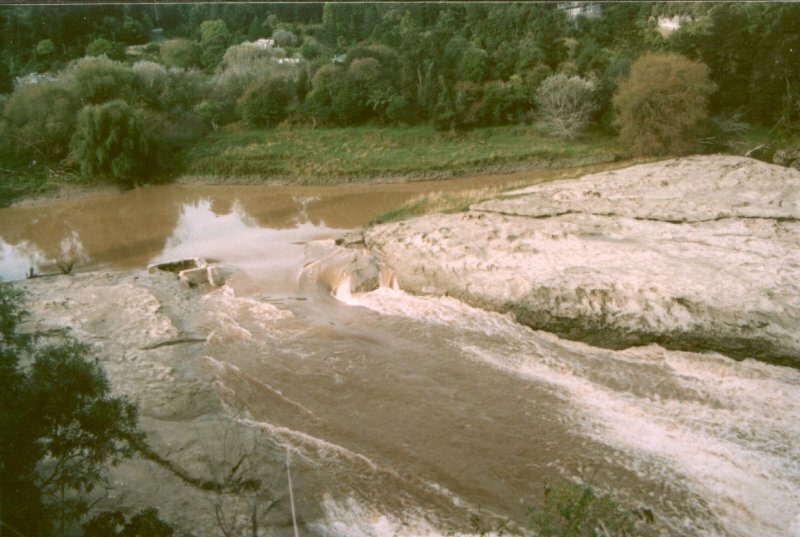 Looking downstream, there's a four-foot fall just below the bridge, and the crest of the upper fall can be seen in the middle distance.
? 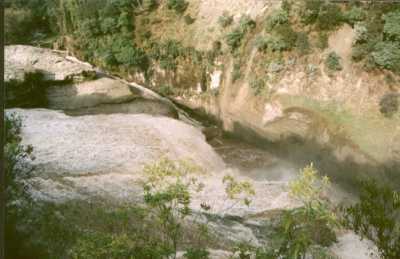 ?Bridal Veil stream channel on left? Aniwaniwa Track along the north bank starts just by the bridge. After 150 yards, looking back through the trees, I was facing the upper fall, with the four-foot fall below the road bridge straight behind it. 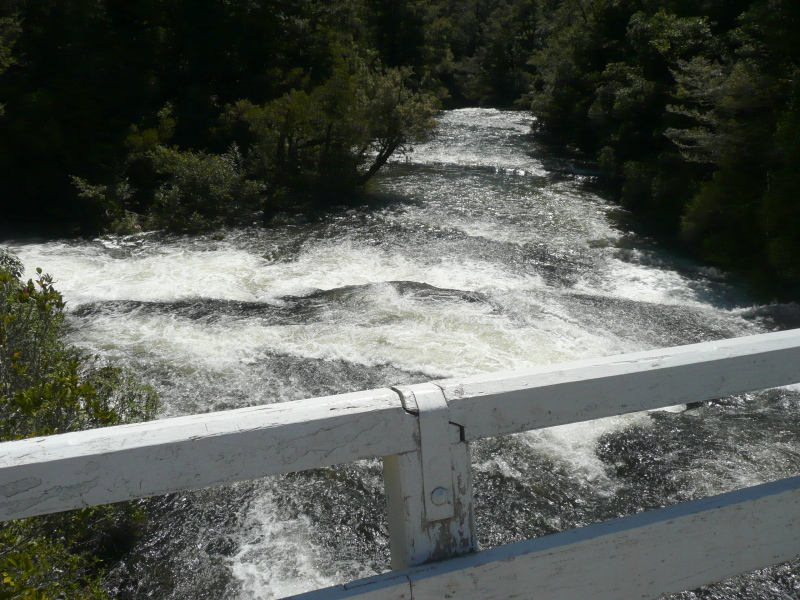 ... then descended to give a head-on view of that fall, and passed some rapids to reach lake level. 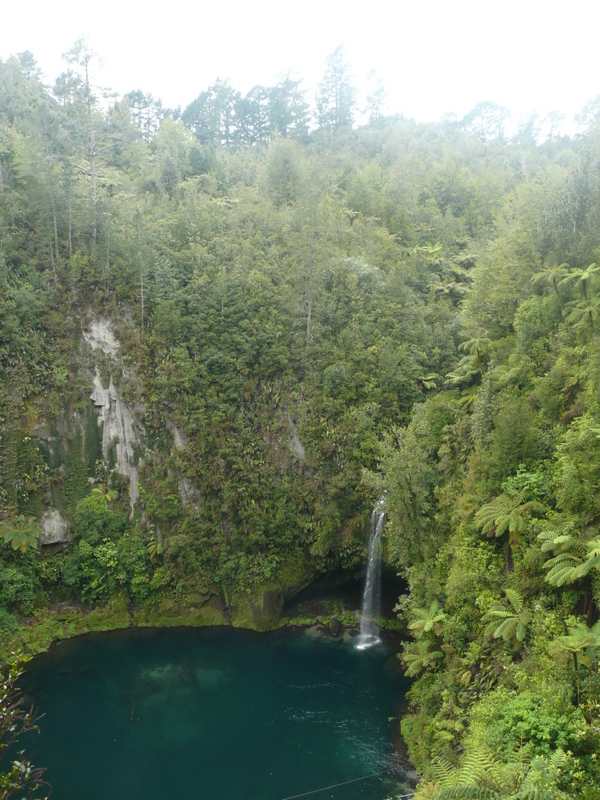 I walked up and down the track twice, carefully counting waterfalls to make sure I hadn't missed any. 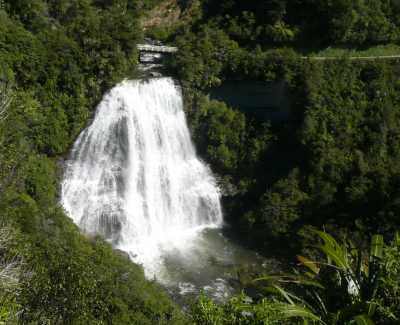 I concluded the author of the Guide must have mistaken Bridal Veil Falls, when seen in the distance from below Aniwaniwa Fall, for a third waterfall. 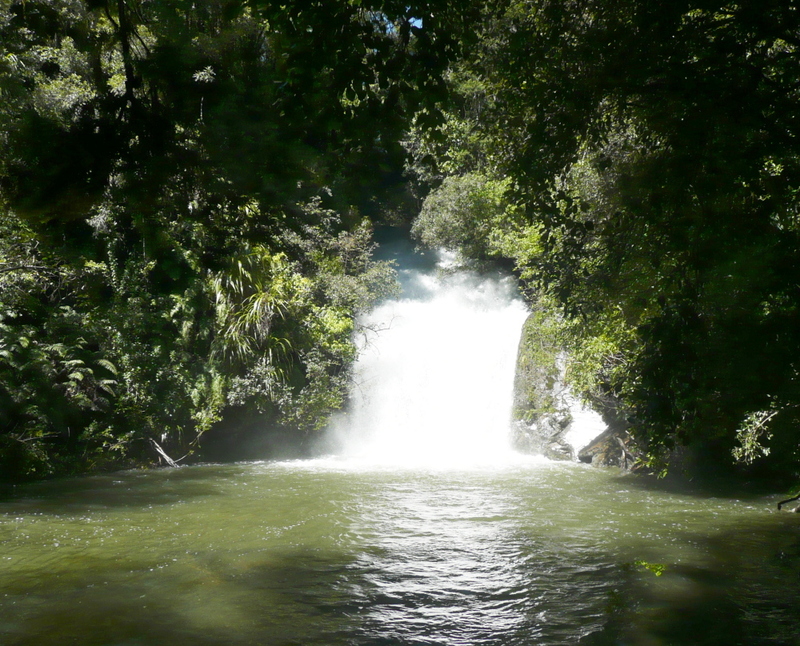 But when I got home the mystery deepened, the Guide shows three individual waterfalls, and they correspond with my own photos (allowing for more water in the river) which also show three falls. Yet there were just two falls between the road bridge and the lake. The map was no help, nor was Google Maps 'satellite view'. At this point I was starting to doubt reality. 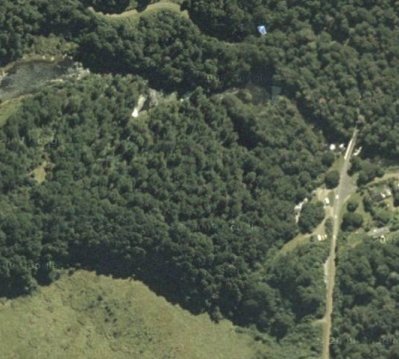 Then I noticed something, if you look closely at the 'satellite view', you can just see a thin dark line that curves round to the south of the main river, starting just below the road bridge. 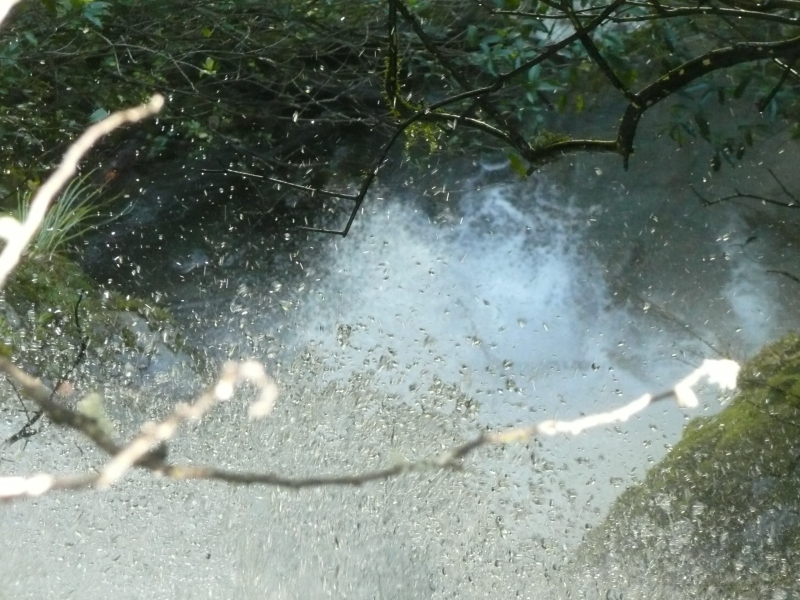 Remember I said the stream to Bridal Veil Falls is overhung by trees? That thin line on the air photo is it. So that's my solution to the problem, in the sketch map at right. Ironically, not one map I can find agrees with it. But if you visit the falls and find the spirits of the forest have changed geography again, don't blame me. ...and over into the chasm. cascades down the end of the gorge (top of picture). 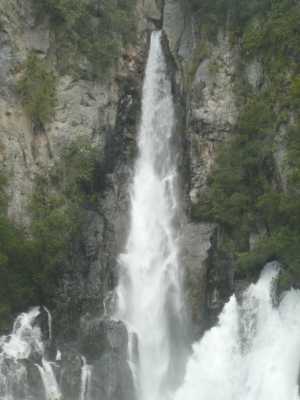 15 miles northeast of Wairoa and just beside the secondary 'inland' road to Gisborne, lie the Te Reinga Falls. 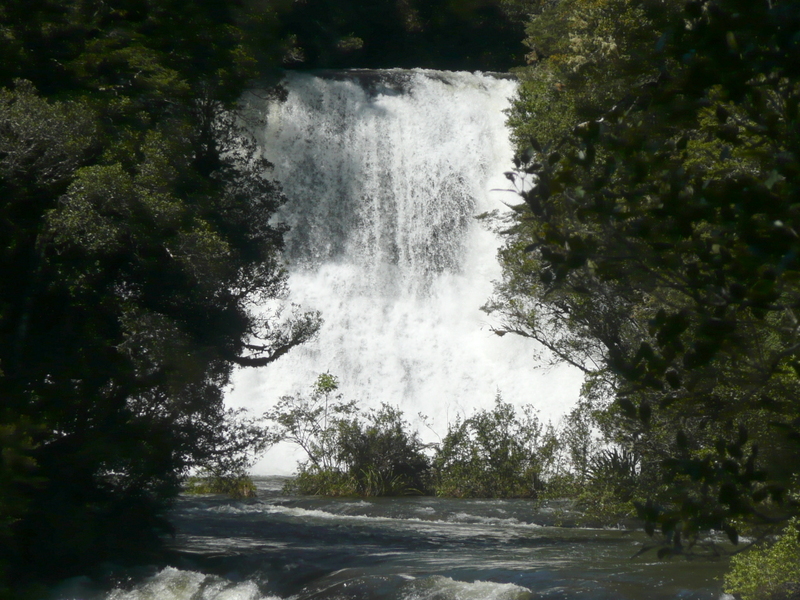 These falls are not elegant or graceful. They look dangerous, violent and rough at any state of flow. 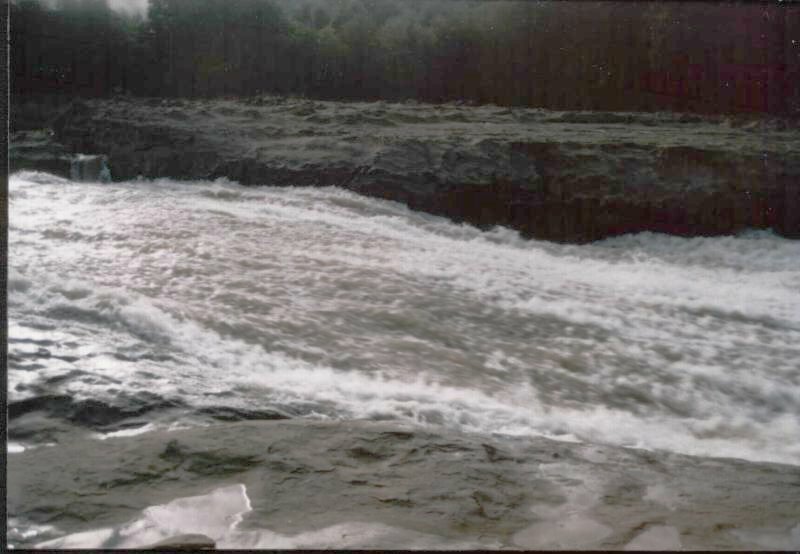 The water flows smoothly through the remains of a large concrete V-notch measuring weir then races across a broad sloping shelf of water-worn bare rock riverbed before plunging 35m (115') into a deep narrow chasm. You can approach the side of the torrent but everything about it says "This river means business - don't fall in". 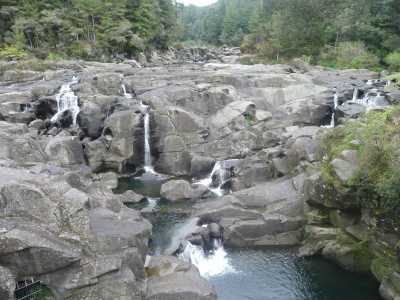 What can it be like in flood when the water fills the whole width of the rock riverbed? 20 miles west-north-west of Gisborne by remote (but tarsealed) country road, lies Rere Falls, a very graceful broad waterfall and quite surprisingly 'tame' in this rather wild countryside. The road crosses the stream in a bridge just above the falls (just visible in the photo).